“This Is Not Calvados” is a premium product targeted at Calvados enthusiasts. It is made by a small Finnish distillery using only biodynamic, naturally grown apples, no food colour and no other artificial additives. Since the beverage was made for a niche market with fierce competition, the packaging design of the numbered bottles has been made to stand out and distinguish itself from other products in its category. The clear statement on the label “This Is Not Calvados” communicates the genre and challenges Calvados products outside the Normandy. The design aims to create a natural and hand-made look and feel. The light but strong package, made of environmentally friendly cardboard, also protects the product during transportation. In addition, it is stackable and, thus, can be turned into nice display sets in tax-free shops and other retail stores. The bottle’s masculine form and the straightforward design of its label, featuring grotesque Franklin Gothic lettering, lend it a pure and powerful image. 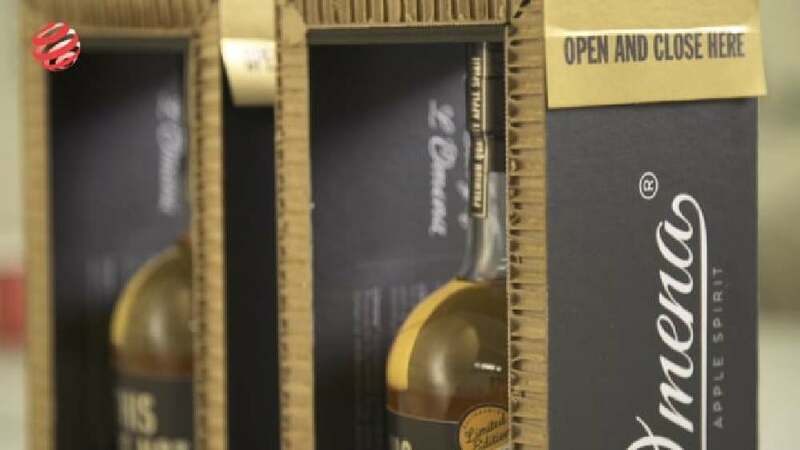 The packaging conceals nothing but makes its original content immediately visible and, thus, reflects the natural, hand-made character of the spirit, produced using no additives of any sort. The package itself, made of strong, environmentally friendly cardboard, gives the bottle enough protection and also makes it easy to transport. It is even stackable for the arrangement of individual presentations in retail stores.